Time Toys is a 2016 family film that focuses on a group of kids that find a box of toys from the future. Dalton Cyr, a 16-year-old musician best known for his pop music covers on YouTube, has a small part in the film. To help promote the movie, a music video was created for one of Dalton’s songs that features scenes from the movie and behind the scenes footage. The song is called “The Way It Should Be”. Dalton Cyr playing his guitar in black chucks. The song is definitely influenced by ska music and features a skank guitar riff. The lyrics are pretty innocent and generic. Dalton sings on the hook that everything is great and that that is the way it should be. Lyrically, this all fits with the tone of the movie, with its feel good sentiment and family friendly lyrics. The music choice also works with the setting and video. It all fits very well together and Dalton has the right voice to pull it off. A behind the scenes look at the cast taking promotional pictures. 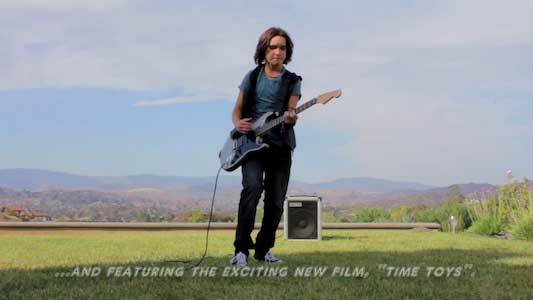 The music video features footage of the young cast of Time Toys dancing in front of a green screen. These shots are very reminiscent of old videos from ska and punk bands of the 1990’s and early 2000’s such as Sublime and The Red Hot Chili Peppers. Griffin Cleveland, who plays Matt in the film, is seen wearing chucks in both the film footage and behind the scenes footage. We also see some of the crew wearing chucks, as well as Dalton himself in his original scenes for the video. Those scenes feature him jamming away on his guitar in someone’s backyard. The video is a good piece of promotional material for the film, and is sure to get some people to give it a watch. A crew member wears chucks in the video. Get a new pair of chucks for your film by clicking on the links below.